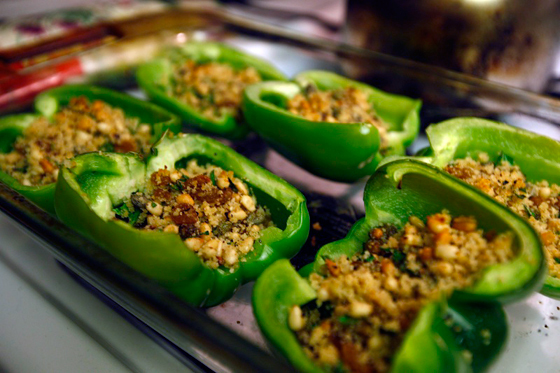 Here’s a Sunday night recipe: warm stuffing inside peppery goodness…and it’s good for you, too! If you want to swap the breadcrumbs out of this recipe out for cooked couscous or cooked quinoa, feel free. You can always tailor recipes to your own unique tastes and needs…or to what you have in the cabinet! Peppers are in season in summer and fall, and while we definitely advocate eating fresh, in-season veggies, we couldn’t wait six months to post this recipe…!